This high mountain tour stays almost entirely on glaciers, traversing the enormous complex of icefields forming the "headwaters" of the Aletsch Glacier—the longest valley glacier remaining in the western Alps. As such, it is not to be confused with the Grindelwald to Leukerbad Bermer Oberland trek, which though rugged, remains on trails. Here, on this off-trail traverse, we walk among some of the most famous giants of Swiss mountaineering history; the Eiger, the Jungfrau, the Mönch, the vast panoramas mimicing those of Alaska or the Himalaya. Once under way, every night is spent in a true mountain hut. Every morning we rope up and cross crevassed snow and ice fields, from one cozy and welcoming hut, to the next. Comfortable sleeping quarters, and tasty and satisfying meals prepared by the hutkeepers, allow us to travel light while still enjoying a restorative evening's rest from the day's efforts. 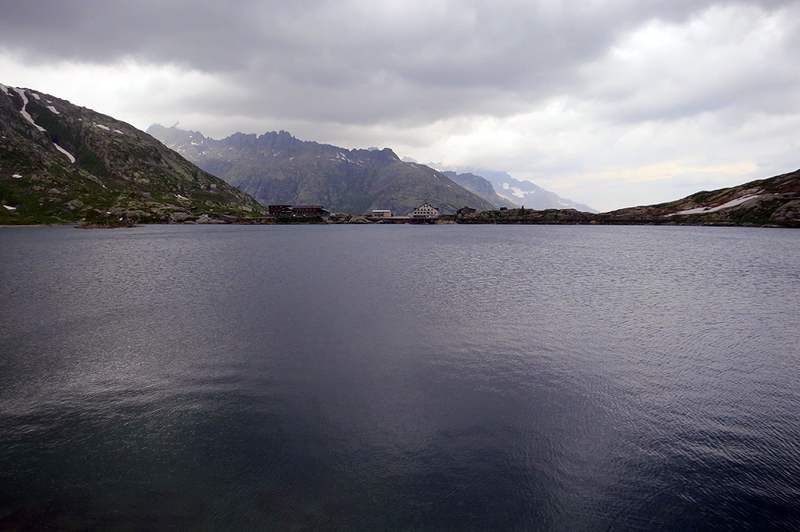 Our route begins at the western end of this mountain group, in the Gasteretal, and takes us eastward over several glaciers and high passes, to end a week later at the road on the Grimsel Pass. If weather and the inclinations of our group are favorable, our schedule allows for the possibility of climbing a couple of easy peaks, the Äbeni Flue early on, and the Oberaarhorn near the end of our trip. We offer this trip as either an open trip, on which you can sign up by yourself and join a group, or, as a private program for just you and your friends/family. For booking either an "open" trip or a private trip, you can fide more information on the booking procedure here, Booking Trekking Information. Guiding fees are the same for either an open trip or a private trip. Fee information can be found here. Kathy can take a maximum of 5 trekkers. We are happy to run the trip with as few as a single trekker. However, as you can see from the fee structure, the price varies with the number of trekkers. Andy on the way to the Mutthorn hut. 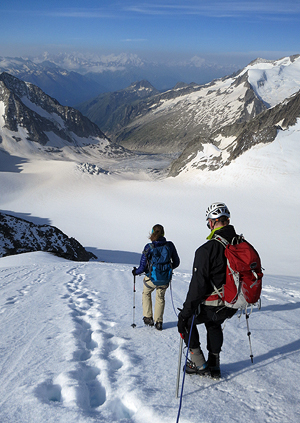 The Berner Oberland Glacier Trek is a high mountain route with all that that implies. 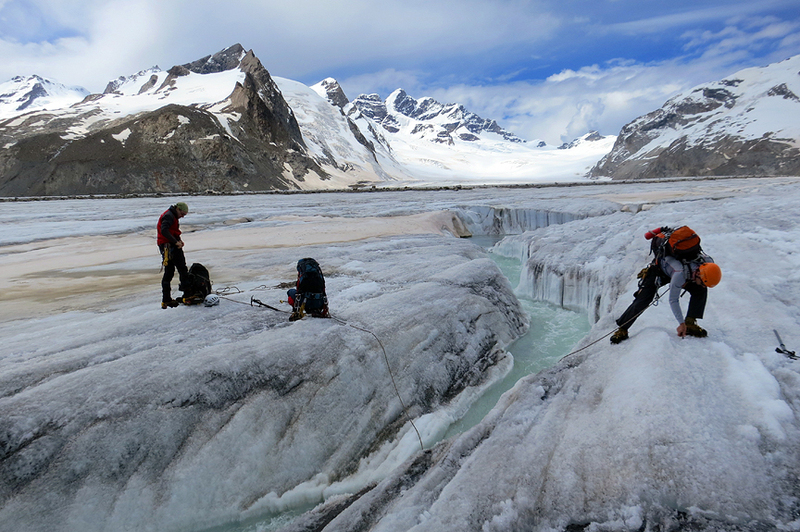 The route we follow involves travel on crevassed glaciers for most or all of every day. We cover from 6 to 14 kilometers most days and our elevation gains or losses per day are occasionally in excess of 1000 meters. However, the length and difficulty of every day can't be accurately expressed based solely on these statistics. The challenge that they represent is not comparable with the same distance and vertical gain or loss on well-trodden trails. Moving over boulders, ice, soft snow, slush, or scree, especially when the terrain is steep or unstable, can be much more taxing and require care, agility and balance beyond that demanded by hiking even on rough trails. We also may have to cross large streams of glacier run-off, or hop over open crevasses, which can require a bit of courage! Even though this trip is scheduled for July, when the weather is typically dry and relatively warm, new snow and poor weather are always possible, especially at higher elevations, and this can make travel considerably more difficult. The most significant hazard on this trip is injury resulting from a slip or fall on steep terrain, or that posed by shifting boulders and scree—we cross several sections of these laying on top of glacier ice, so they are inherently unstable. Additionally there are hidden crevasses on snow-covered glaciers, and though these present a concern, even when roped up, crevasse falls are very rare. Rockfall is also a possibility any time we are on steep ground, but again, for most of the route this hazard is not common. Hypothermia is another hazard we need to manage. Proper clothing with adequate layers, along with careful self-monitoring to stay warm without sweating, should allow us to avoid this problem. Much more common, but not so life-threatening, are blisters and sunburn. Crossing an "ice canyon" on the Konkordiaplatz. This is a trip for experienced mountain walkers. Significant experience in off-trail travel and scrambling on rocks and boulders and snow is required. Previous experience walking on glaciers or with the use of mountaineering equipment, while helpful, is not required. Most important are an excellent level of fitness and stamina. Good agility, a head for heights, and a sense of adventure are also pre-requisites. This is as much a mountaineering experience as it is a trekking program. On every day we have to cross large glaciers. We spend a great deal of time walking in snow or on bare glacial ice. Though the travel is generally technically easy, a long day in the snow can be tiring if you are not used to it, and crossing unstable boulder fields and loose scree can be very challenging and even somewhat risky. 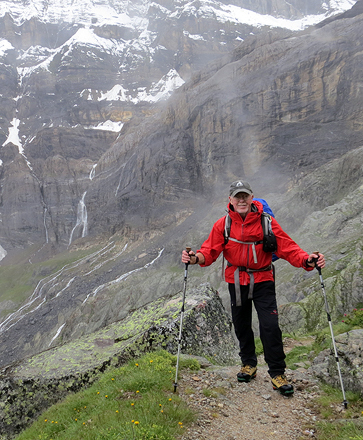 If off-trail snow and ice and strenuous off-trail rocks and scree are not your cup of tea, then you should probably consider the "Grindelwald to Leukerbad Berner Oberland Trek" which stays almost exclusively on trails. If you have any questions about the appropriateness of this trip for you, please contact us. Rendezvous in Interlaken, evening meal and night in a hotel. After an early breakfast, we board the train for a quick transfer to Kandersteg, then continue by shuttle van on steep dirt track up the Gasteretal to the road end at Selden. From there, our walk begins on trail, along a cascading mountain stream, then more steeply up moraines and rocky bench, to the glacier's edge. After a quick lunch, we rope up for the rest of the walk to the Mutthorn hut, high on the watershed between the Kander and Tschingel glaciers. With more than 1400 meters (4600 feet) of elevation to gain, and more than 11km to travel, this first day is a real doozy, but sets us up for success on the rest of the trip. Beginning again on glacier, we climb from the hut up to the scenic crest of the Petersgrat, with its panoramic views of the rugged ridge of the Blüemlisalp to the north, the Bietschhorn to the south, and our first glimpses of the Aletschhorn to the east. We descend snows and a steep track down to the village of Fafleralp, then climb again along meadowy benches to the Anen hut. Beginning on rugged trail, we soon head out onto the Langgletscher, and finish the day on steep snow slopes up to the Hollandia hut, perched on a promentory commanding the Lötschental. Though steep in places, this day's walk is relatively short. 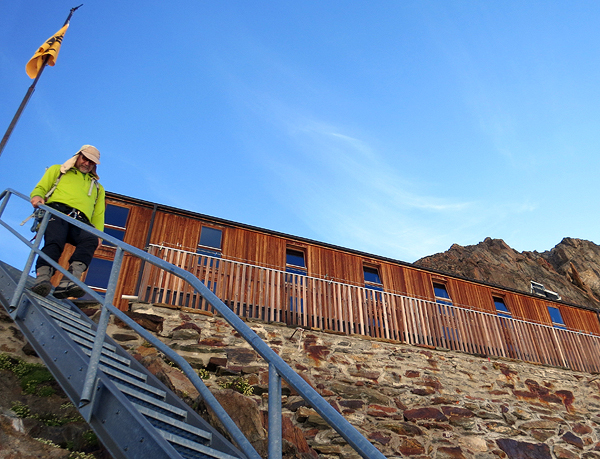 Relaxing on the deck of the Konkordia hut. 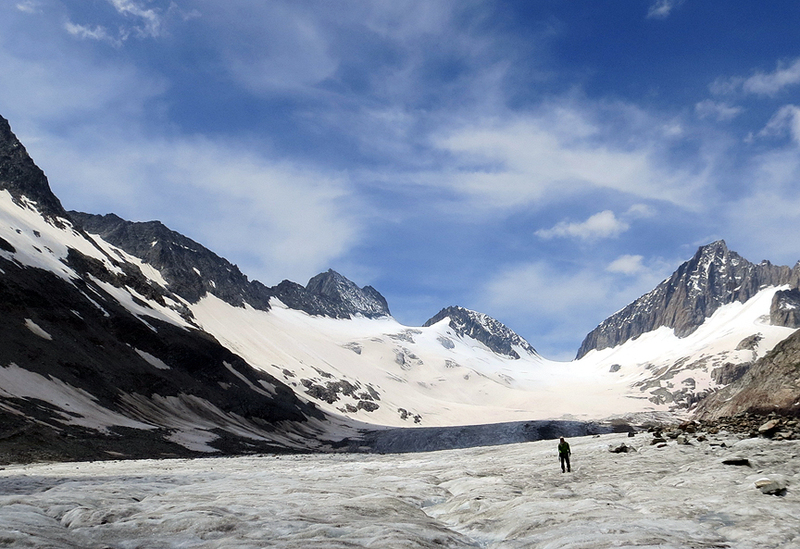 On this day we truly enter the vastness of the Grosser Aletschfirn, the upper reaches of the Aletsch Glacier. Another potentially short day, we have the option of getting up in the pre-dawn for a side trip to climb the snowy Äbeni Flue. 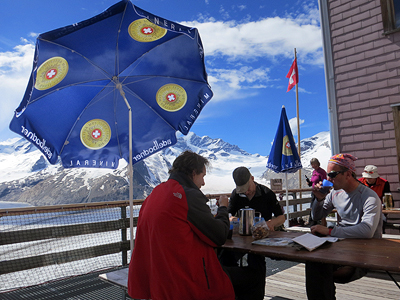 In this case we would return to the Hollandia hut for a snack or lunch before continuing on to the Konkordia hut. 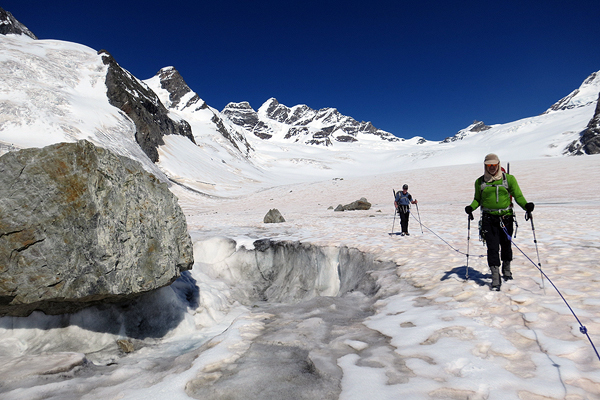 If we head straight for the Konkordia hut in the morning, we will have more time to negotiate the labyrinth of run-off streams as we cross the low-lying ice plain called the "Konkordia Platz", where the feeder glaciers all meet and flow into the Aletsch Glacier. A few hundred feet of steep, intimidating but easy flights of metal stairs and we are at the hut! 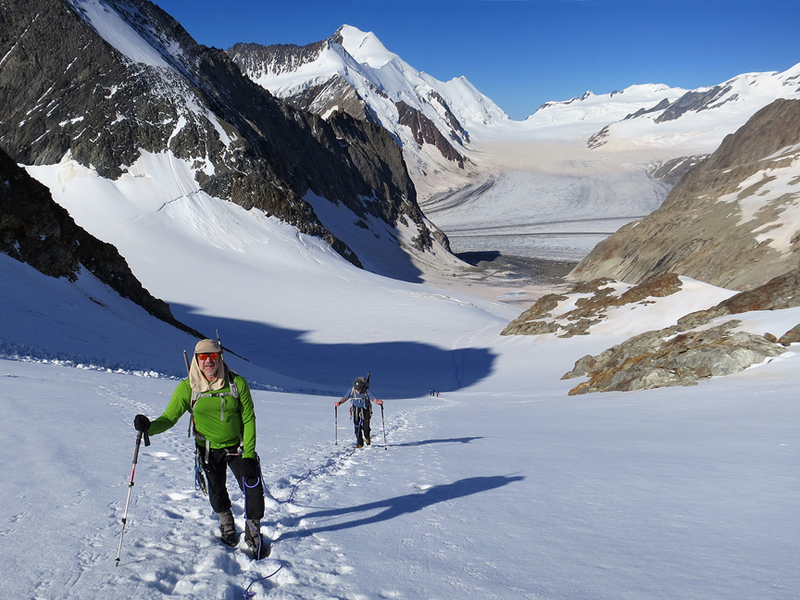 Another day all on glaciers, we pass through the high col of the Grünhornlücke, then descend gentle glacier snows to finally reach a steep, cable and chain-equipped track that leads up to the Finsteraarhorn hut. From the terrace we enjoy views of some of the highest peaks in the area; the Fiescherhorn, Finsteraarhorn, Gross Wannenhorn, and bask in being truly isolated from civilization in this back corner of the Alps! This day we contour around the ridge of the Finsteraarhorn, going from the foot of its west side, over to its east side. We descend typically to below the snow line, tramping on bare ice before we head back up again to the Oberaarjoch, and its cleverly perched hut. If we are early and feeling especially frisky, we may have the option of climbing the Oberaarhorn, a steep but non-technical peak just above the hut, and an amazing viewpoint. If we did not climb the Oberaarhorn the afternoon before, we have another chance this morning, if we want to get up in the dark and see the sunrise! In any case, we then descend on easy glacier to the lake called the Oberaarsee, and end with a short but steep walk up to the restaurant at the Berghaus Oberaar. Here we will meet our shuttle to take us the last 4-km to the Grimsel pass, and the lap of luxury! We will continue on back to our hotel in Interlaken for a last evening together to celebrate a tough but rewarding week. John and Andy climbing up to the Grünhornlücke.